Montblanc has announced its latest pen in the Artisan series of fine writing instruments. 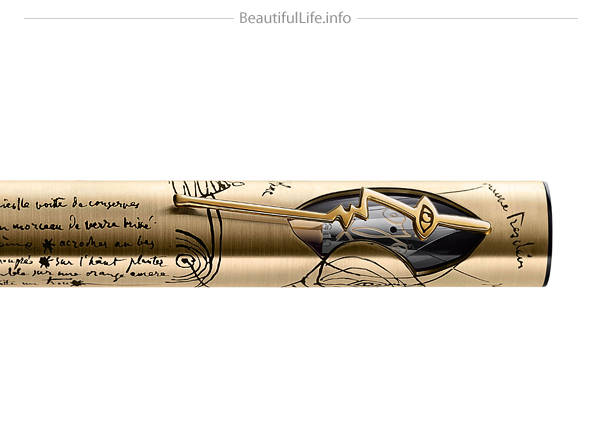 Essentially a tribute to Pablo Picasso the pen forms the shape of a pencil with the cap sporting a design inspired by the artists drawing “Portrait de jeune fille.” Worked from Mont Blanc’ signature precious resin and 18 carat gold, the nib features engraving inspired by the artist’s iconic drawing Ojo. The Limited Edition 91 has been cast in 750 solid gold, and features an 18-carat gold rhodium plated nib carved with Picasso’s famous “Ojo” drawing. The $33,800 pen sports a barrel with lacquered red bands that is reminiscent of Picasso’s Spanish origins. The second more precious fountain pen, the Artisan Edition Pablo Picasso Limited Edition 39, comes with a cap made of 750 solid white gold and a diamond. This one honors the painter’s muse, Sylvette David, on whom Picasso created 39 paintings and drawings. It is available at a price of $55,000 in a worldwide Limited Edition of 39 units. The Artisan Edition Pablo Picasso Limited Editions can be purchased from Montblanc boutiques as of September 2012.